Several years ago while in Poland teaching at a conference during a break I took a short walk and found these rather interesting steps. Steps that led to “no place”. In our lives we trudge up the steps making choices only to discover when reaching the summit it is not the place we thought we were headed. Then frustration settles in, next our outlook towards life in general changes. The good news is that we can shift from a negative to a positive attitude. How are we feeling about the people around us today? What approach are we taking toward the challenges that are facing us this week? Do we feel grouchy and aggravated about life in general? Are we looking forward to each day with renewed optimism? Are we looking at life with a buoyant “can do” spirit? Our life, good or not so good, consists in the accumulation of our choices. Our mental disposition, which is the way we view life, forms our attitude. It is as though we are holding a handful of wet clay. We have the ability to mold the clay into a demon-like figure or that of an angel. The Bible tells us we can mold our character into one of grace and purpose or into one driven by fear and hate. It is our choice. Some people think that the attitude they live with is programmed into their mind never to be changed. Not so! God has given us the ability of renewing the attitude of our mind. At this point in my writing I could write in big bold letters: “Change our attitude” and be done with it. That would be like me standing on the beach, yelling to a drowning man; “Float man, float!” He can’t and doesn’t know how. This is the same with our attitude, some are not aware that it can be changed or do not know how to go about it. But, wonder of wonders, I can change from a negative to a positive attitude. Just as I would throw a rope to the drowning man to grab onto, I have some “choice ropes” that can pull my mind in a more positive direction. Choice Rope #1. Grab onto the realization that everyone has problems. In fact every miracle recorded in the Bible started out as a problem. Let’s not feast on the problem, instead dig for the solution! Where problems live, solutions abound. Pray, believe and ask God to direct us to the solution. Go to a trusted friend or pastor, clearly define the challenge and actually ask if they have a solution. Just don’t let the problem define your attitude. When you have gathered a few choice solutions, pray and think over the course of action. Then work the solution, not the problem. It is a whole lot more fun and productive working on a solution than it is on a problem! Choice Rope #2. Hold onto these 3 very important statements found in Rev. 12:11. People overcame him by the blood of the Lamb / believing in someone bigger than themselves. By the word of their testimony / remembering past victories big and small. They did not love their lives to the death / never give up! The focus of your attention determines your attitude. Our Lord has all wisdom. Surely you have had some victories to celebrate and you must not give in to complacency. Begin writing a list of the many times your prayers were answered. Jot down a list of victories. This list provides a powerful tool in your hands to overcome a negative attitude. Last, never give in or give up. At times your troubles seem to be insurmountable but knowing you have; (1.) help, (2.) a list and (3.) you are not giving up, will serve you well in building a more positive attitude. 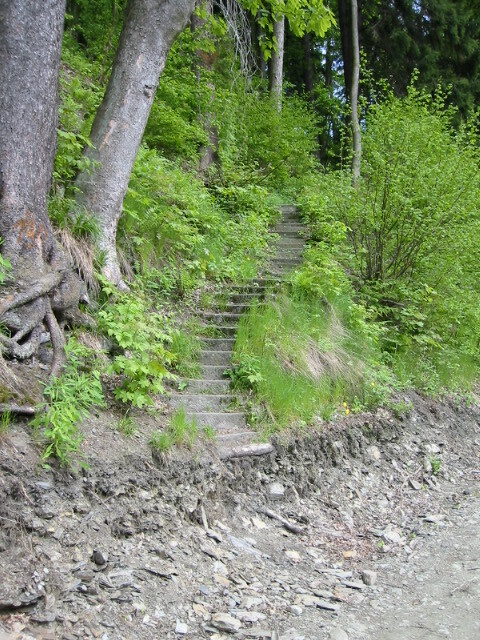 These steps lead to a more positive summit.